Talmudist of the fifteenth century. He was the author of "Shelom Ester," a commentary on the scroll of Esther (Constantinople, 15th cent.). Steinschneider, in Benjacob's "Oẓar ha-Sefarim" (p. 583, No. 679), attributes to the same author the following three works: "Ketem Paz," a commentary on Canticles; "Mebaḳḳesh Adonai," a commentary on the Pentateuch; "Mor Deror," a commentary on Esther. 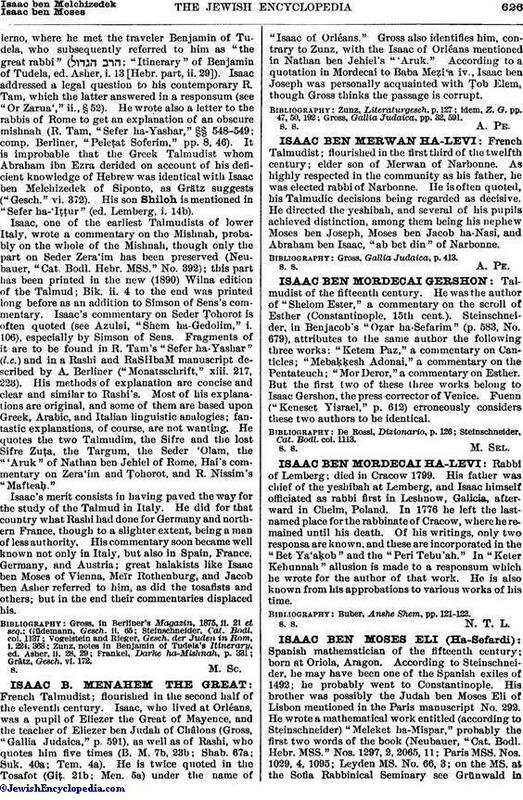 But the first two of these three works belong to Isaac Gershon, the press-corrector of Venice. Fuenn ("Keneset Yisrael," p. 612) erroneously considers these two authors to be identical. Steinschneider, Cat. Bodl. col. 1113.